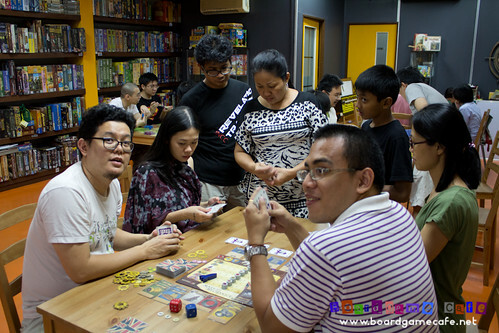 Gamers: Dr Wan & family, Marcus & frens, Sinbad, Ivan, Kareem, Henry Yeo, Heng, CK Au, Waiyan & others. 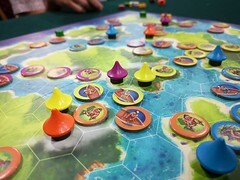 Games: Dixit, Takenoko, Ticket to Ride Europe, Libertalia, Sets, River Dragons, King of Tokyo, Bang, Citadel, Kingdom Builder, Ubongo, Heck Meck, Jungle Speed, Take 6, Halli Galli, Spot It, Forbidden Plant, Power Grid: Brazil, 18TN. 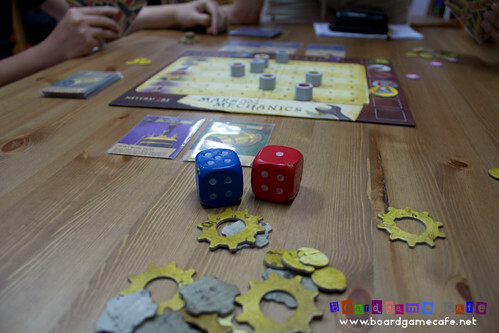 So let’s get going with Kickstarter Meetup #1 this week where we managed to get…. erm, three Kickstarter games checked! Not bad for a start. 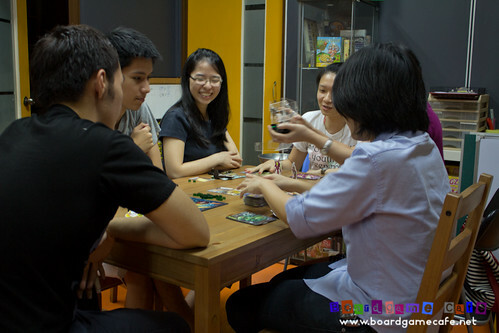 Before the crowd settled, some of the early birds got started with some of their own fave games (non Kickstarter) such as DIXIT…. 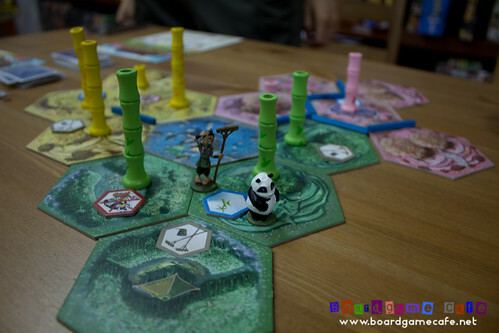 … and TAKENOKO. 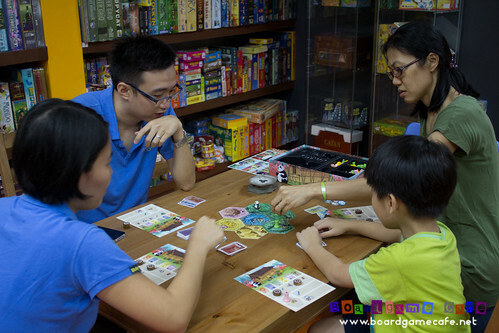 Dr Wan’s family was in town and his young son joined waiyan for Takenoko. 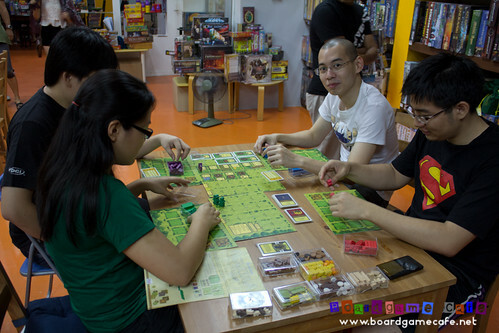 He has played Takenoko a while back @ OTK but surprisingly he still remembered the rules!! 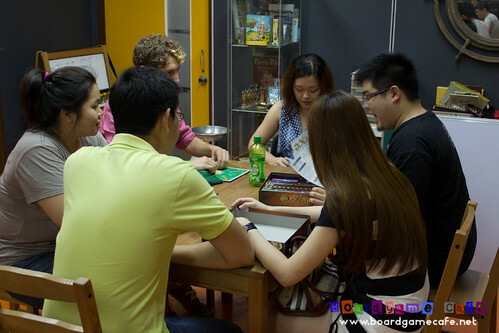 This group continued with TICKET TO RIDE EUROPE after Takenoko. We decided on the BRAZIL map since all four have not done this map before. 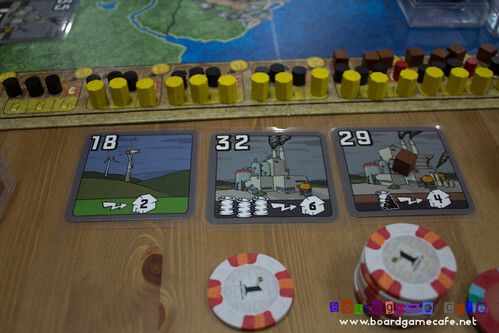 In POWER GRID, your 2nd power plant tends to dictate your strategy a little.. 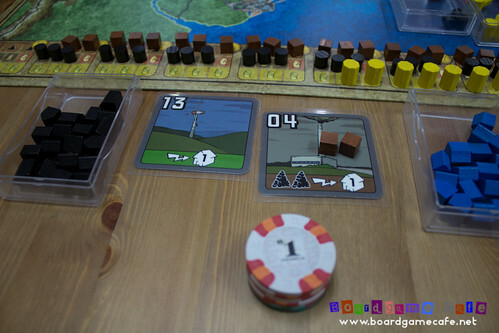 In this game, I went with the eco path when there was little resistance in bidding for the #13. Coal price on their way to “hell”…. I think some of us underestimated the supply/demand curve for coal in this (Brazil) economy. My power plant inventory in mid-game. Still with an eco-plant but have switched to oil (which has better supply than coal in this Brazil map). At this stage, I’m actually a step behind in terms of getting the required end-game power plants. 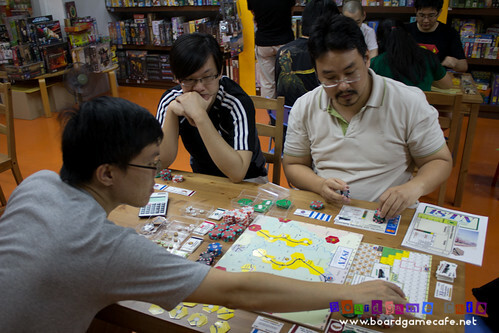 Heng’s mid-game power plants. The #20 is usually a good end-game power plant but not in this Brazil map. This is one of the features I admired in the Power Grid system. There’s no “permanent” good power plants as what’s good in one map may not be in another map or situation. You need to adapt to the changing landscape. Henry’s mid-game power plants. 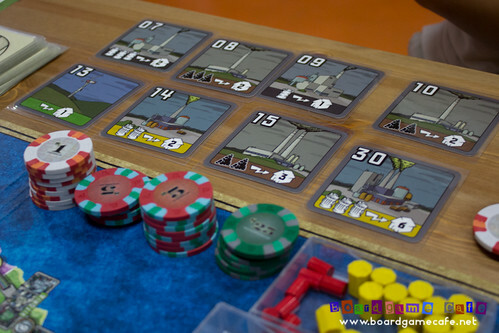 On paper he seemed to have ran ahead of us in getting the end-game set however he has invested too heavily into coal plants which will hurt him in the later stages of the game. Ivan’s mid-game plants. He has wisely divested into garbage-based plants and no coal. I’d thought he’d a good advantage as there was no competition for garbage at this point of the game. The map build at mid-game (Step 2). 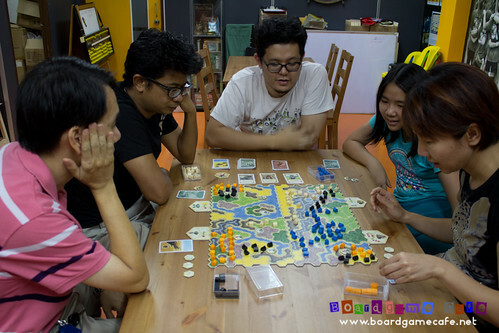 Henry-blue has the best map advantage in the north while Heng-yellow has the next best. 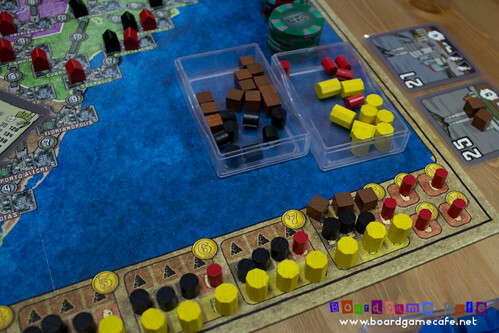 CK-black was competing with Ivan-red in the south and reaching the point where we need to decide if we were going to jump into the northern areas (across the expensive build pipelines). Black’s crowding of the cities in the south probably stopped Red’s growth momentum. Henry was still keeping his coal power plants into the late stage of the game… I thought they overstayed given the coal market has just gone to hell (below)! I think the coal market and Henry’s reliance on coal power plants costed him the game. 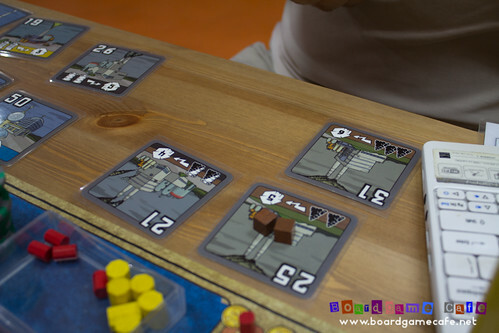 It was a nail-biting finish as Heng has cash to build more than 17 cities (the end game trigger point) but can only power 16, while I was able to power 17 but searching desperately to see if I have enough cash to build up to 17. 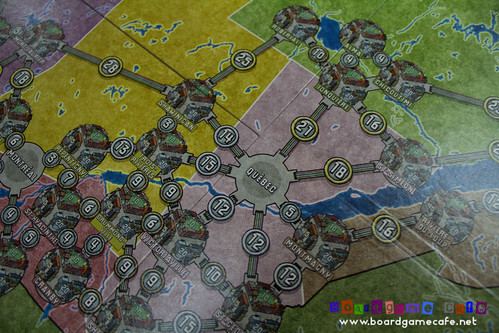 It’s great to get to play Power Grid especially when exploring the nuances of a new map. 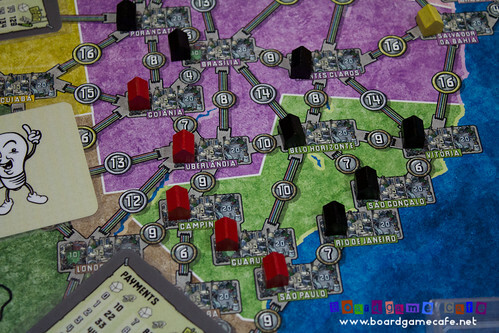 After our BRAZIL session was over, we previewed a few of the newer Power Grid maps such as Northern Europe, UK & Ireland, Quebec and Baden-Württemberg. More interesting challenges in these maps. After GLORY TO ROME, they did LIBERTALIA next. 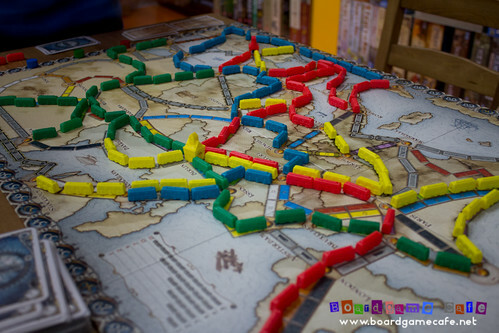 And the Ticket to Ride table next did SETS. 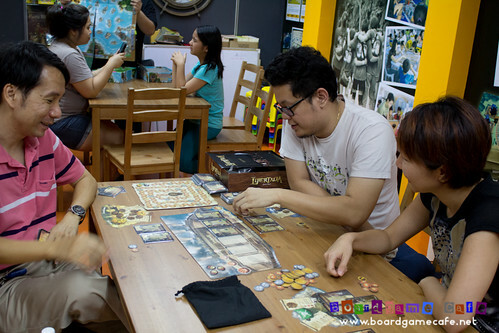 The DIXIT crowd seemed to be hanging on to their Dixit session for a while.. 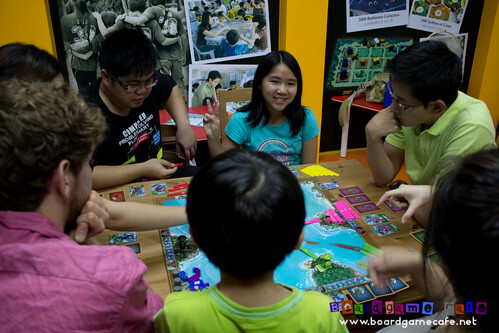 When they finished, they brought out RIVER DRAGONS. 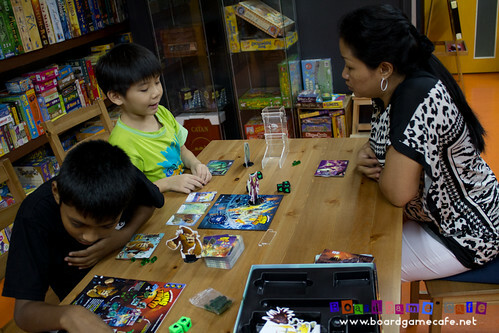 Dr Wan’s son enjoying his time with other gamers whom he just met in this session. 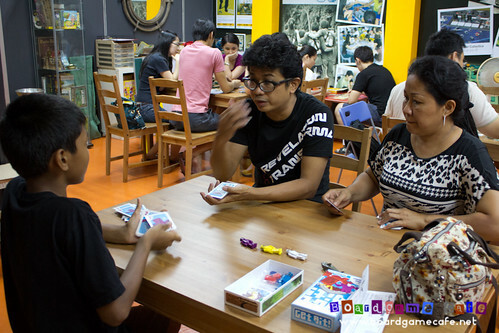 Kareem getting Dr Wan’s family and Ian Tan into last year’s SDJ winner KINGDOM BUILDER. 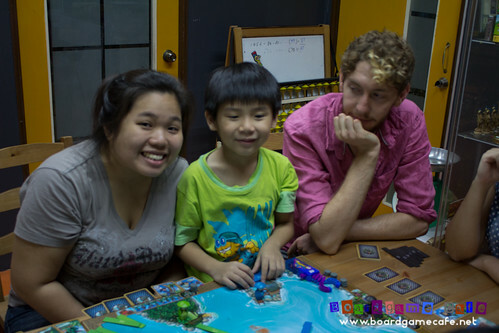 Arugably the boardgame that started the Kickstarter genre – and done it well! 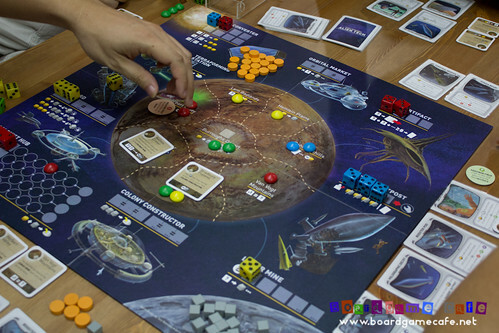 Alien Frontiers achieved USD15k funding back in 2010 for their 1st edition. 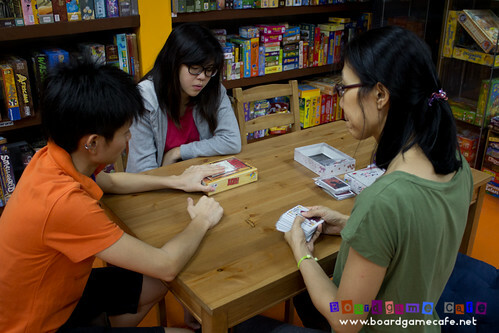 Now they are in their 4th edition print – so that means the game continues to sell. 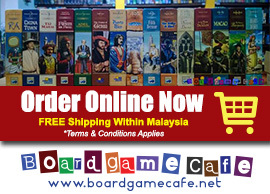 I won’t write about some Kickstarter games, successful in their funding but can’t get past properly past “1st Edition”. 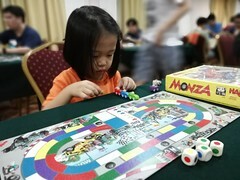 Haiz. 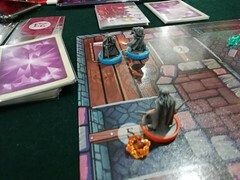 We brought the base game out for this 4-player session; no factions (though I’m anxious to try the expansion). 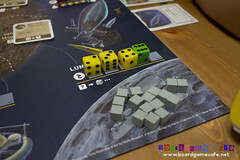 Two key resources in Alien Frontiers: Lunar ore (gray) and Solar energy fuel (orange). 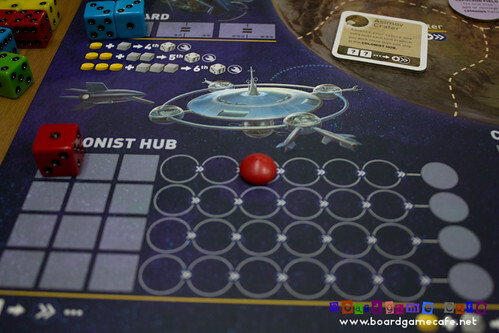 Alien Frontier plays similar to Kingsburg & Troyes in that your die roll determines what actions are available to you. It’s not always necessary to have high rolls (ie 5s and 6s) as the low rolls (eg 1s and 2s) have their purpose as well. So luck of dice is minimize; your high or low rolls only change the options available to you. 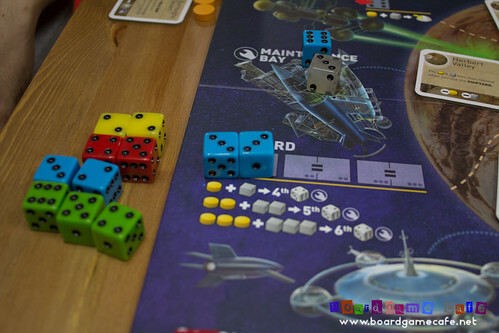 Everyone starts with 3 ships (dice) and they represent the actions you can take (after a die roll). Obviously the more ships (die) you have, the better are your action options (usually). You can get more ships by building them at the Shipyard (above). 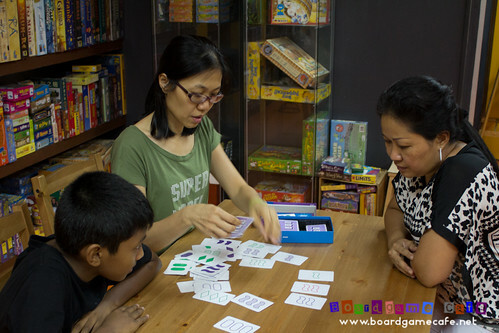 To do so, you’ll need to send in two dice with the same roll (eg double-three). 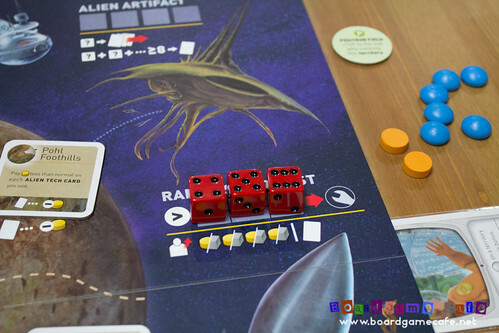 Note: Some of you might think it’s hard getting double-dice rolls but there are plenty of Alien Artifact cards that allow you to modify a dice roll. That’s the “engine” you first need to build. 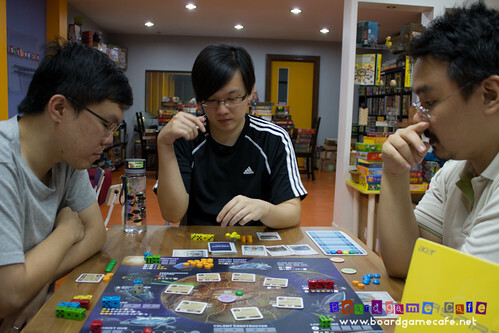 This game is about terra-forming colonies into the planet – as that’s the main source of VP. There’s a fast way (Terra-form action but requires you to sacrifice a dice) and there’s the slow-but-sure way thru the Colonist Hub (above). 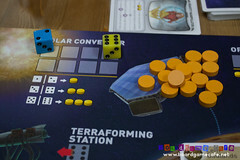 Any dice roll can contribute towards advancing your colony towards the drop point in which you can send them to the planet. 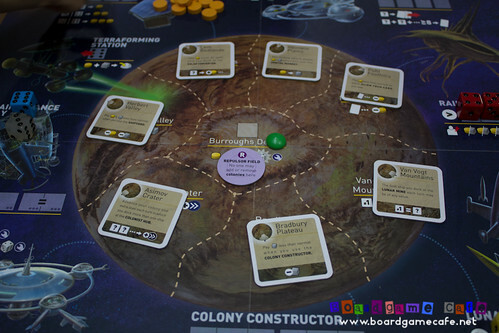 The Colonist Hub options can be a viable option if a player has control of the Asimov Crater which hastens the rate at which you can form a colony thru the Colonist Hub. Alas in our game, the Asimov Crater was disabled very early in the game by Henry! We all blamed him for the slow progress… haha. 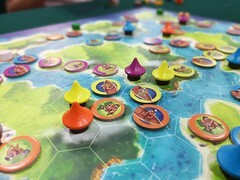 Above: Colonies (round color disc) representing player’s colonies formed on the planet. 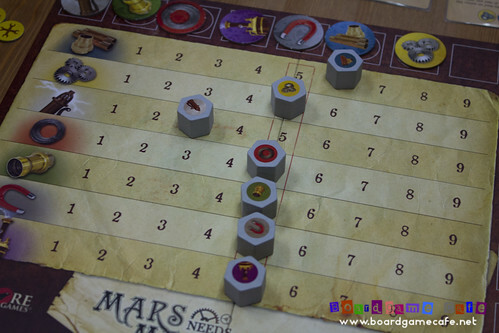 Each colony scores you point plus you get additional point for having simple majority control of each area in the planet. There’s the third option of sending thru the Colony Constructor but it’s expensive and difficult (since you need a roll of three-of-a-kind) to achieve. 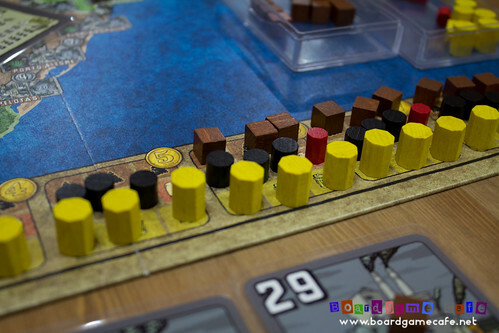 In the sessions I’ve played so far, Terra-form remains the fastest and most popular method even though you do lose a ship in the process (but which you can easily re-build thru the Shipyard). 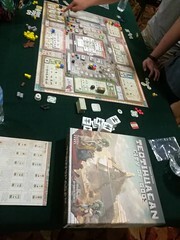 Next session I’ll be keen to bring out the Factions expansion as I’ve heard good feedback about what it adds to the base game. 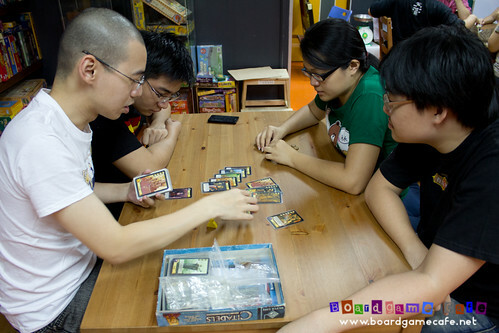 The Factions expansion also adds a 5th player but my thought is that 4-player is the sweet spot for this game. GET BIT got played. 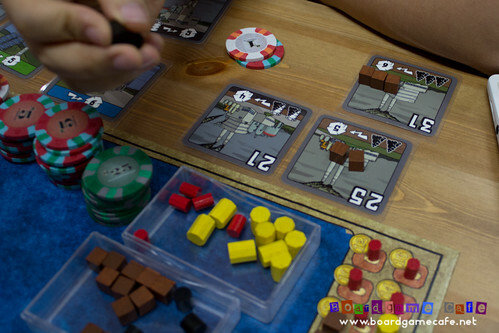 This is a 2011 Kickstarter…. 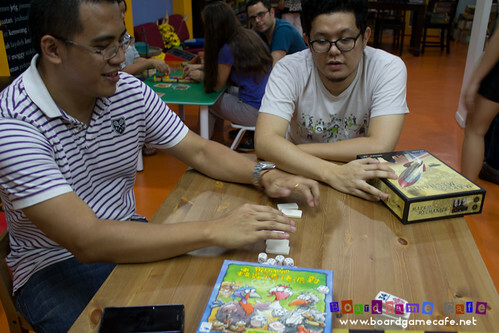 Sinbad came later but immediately settled into a game of die rolling ala Heck Meck! 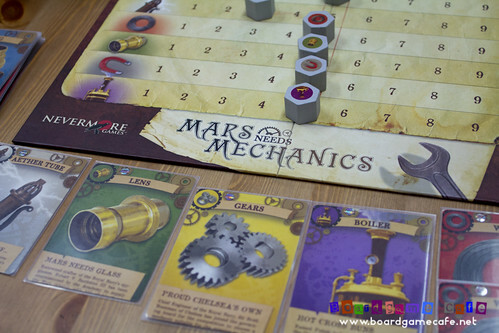 While Kareem prepped a low-profile Kickstarter game in late 2012, MARS NEED MECHANIC. But TAKE 6 is fun especially when you have a large group! Coop fun via FORBIDDEN PLANET. Our fave SPOT IT also got air-time! 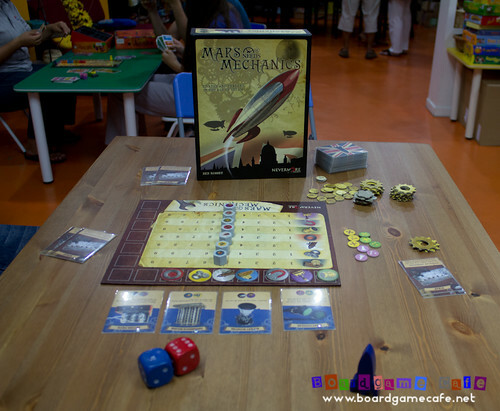 MARS NEED MECHANICS is a low-key Kickstarter game that closed in Oct last year. 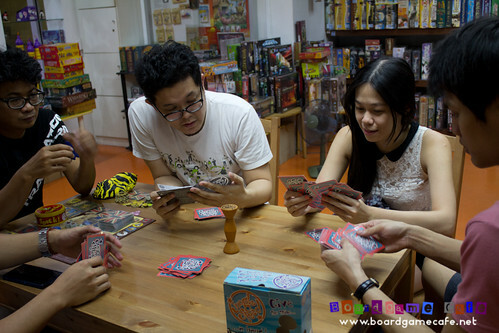 It has spunky artwork and simply rules yet a pretty engaging gameplay. Your objective is to buy & sell resources in the open market where the price for each resource can be influenced by the players in the timing of their transactions. Replayability is thru the use of four Mechanism cards (below) – which defines the “engine” that a player can use to manipulate the supply & demand pricing for the resources (there are 7 types) that he’s hoping to sell. 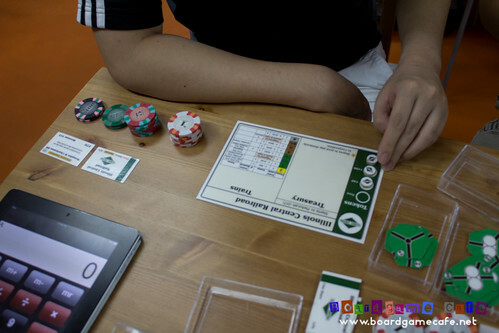 Game is won by the player who profited most from his buy/sell transactions. 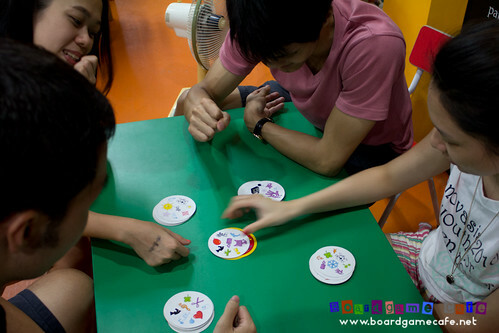 There are 7 different resources; and eight cards are available for purchase each round. 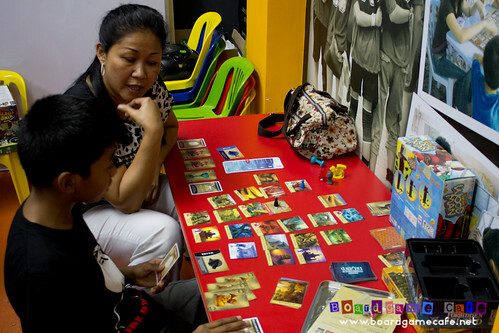 You buy at the current market price, and when all 8 cards are sold – or everyone passes – the 3 recently purchased resources get a bump (+1) to their market price while 3 of those resources transacted much earlier get a knock down (-1). 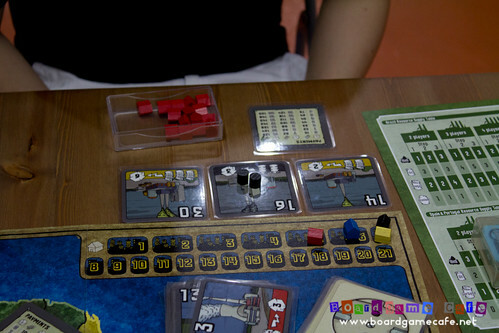 You can also sell resources but you can only sell in sets of three or more. 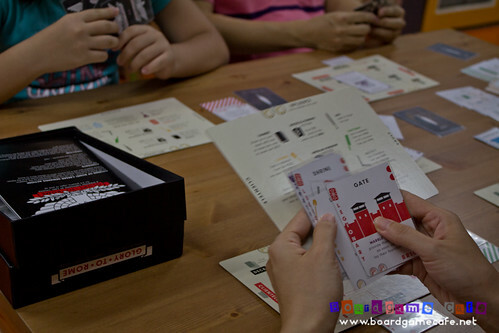 There’s a “scrap” resource card – each player starts with two – that can be used as a joker to form the set of three but has no value by itself when sold. 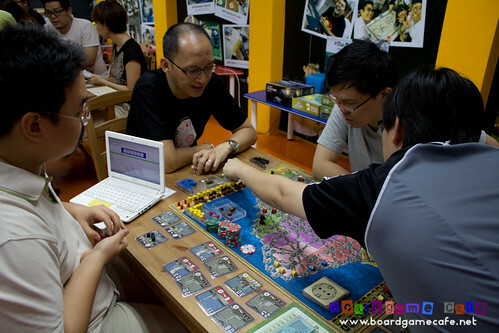 Above: This player can sell the (yellow) Gear resource. 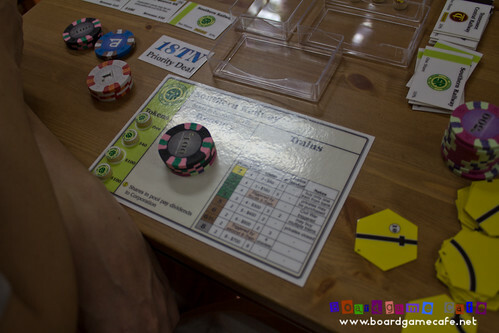 A deceptively simply game to learn but involves plenty of player interaction as everyone’s buying and selling from the same pool hence you do need to read what other players are doing in order to determine which resources are worthwhile future investment; and which ones are junk! 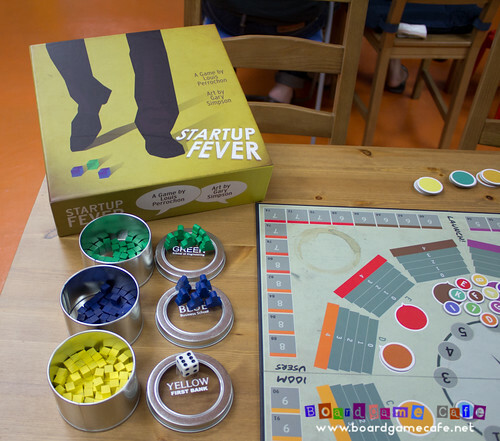 The Power Grid group – after finishing our Brazil session – were debating whether to do STARTUP FEVER. 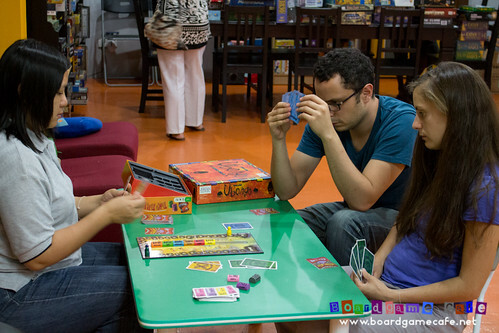 We have 4 gamers only and I informed them Startup Fever is probably good with more players. 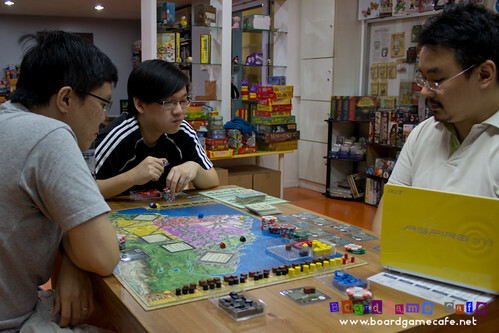 With Heng & Henry around, you knew the discussion would eventually lead to the 18xx path…. 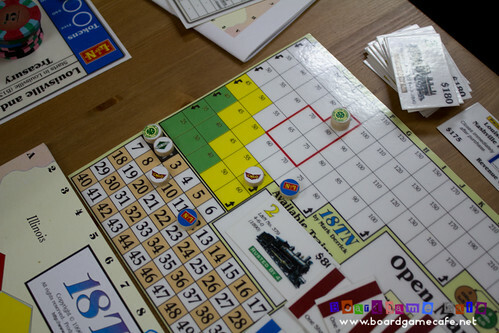 And since Ivan has not done an 18xx game before and won’t mind trying… what better time to bring out one of the baby 18xx as a learning game. So out came our fave starter 18xx ie 18TN which covers a small map of Tennessee & Kentucky. 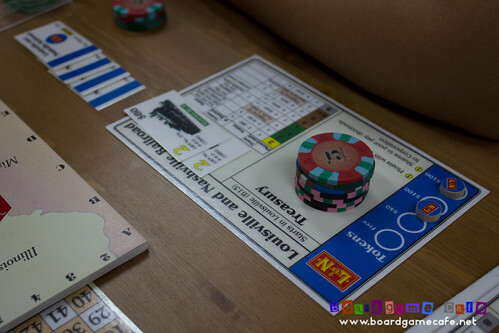 Being a seasoned gamer himself, it was relatively easier getting Ivan into the game rules & 18xx system and off we got started with a quick bidding round to clear the private railway companies. 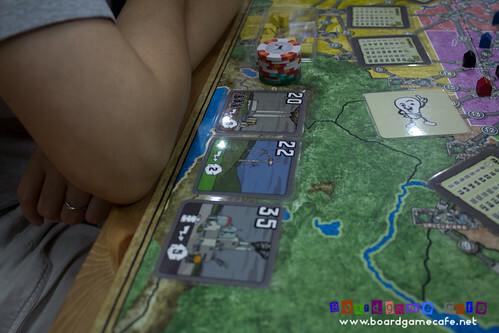 The L&N went straight to Henry and the 2nd company GM&O started by myself – all in the Initial Stock Round. Henry obviously floated the L&N at a high par $80 while I set the GM&O two notches lower at $70. Heng didn’t start any company in the Initial Stock Round but instead invested in L&N and GM&O shares (as did Ivan). 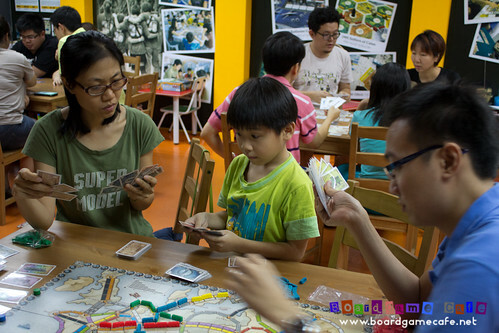 Heng later divested his shares to start his own SR (the 3rd railway compay to start in this game). Ivan did the same in the same stock round. And Ivan with his Illinois Central (IC). 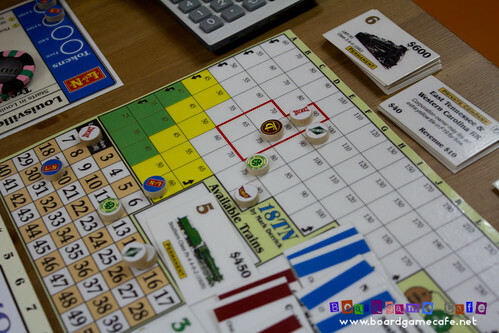 Usual opening runs with prices of L&N and GM&O being depressed as the (initial) investor players dumped the shares in order to raise funds to start their own railway companies. 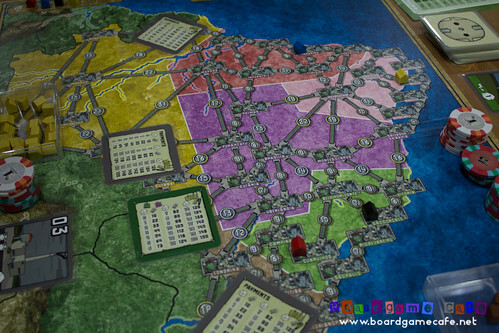 Early build of the railroad networks. Henry’s L&N (the track in the middle) decided to skip past TC (brown) home base in the middle. That’s a lucrative stop and I think Henry didn’t want to include TC into his L&N route to prevent some leechers starting TC and enjoying the fruit of his early hard work. However this decision (to bypass TC) might have a consequence for L&N later. It’s also sending me a clear signal he’s focus on building up L&N and may not go for a 2nd railway company. Ivan’s IC jumped into bed with CK’s GM&O in the upper route and both of us would later work together to break into L&N’s lucrative route in the middle of the board. Heng’s SR started somewhere in the bottom half of the map. 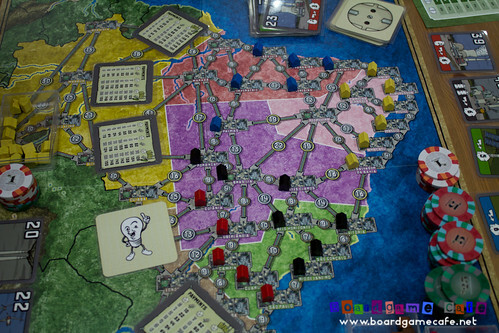 The mid game was pretty uneventful… all railway companies busy building the network and maximizing their runs. Some withheld their earnings for a round or two to keep money to ensure they’ve sufficient kitty in their bank to take care of their soon-to-be obsolete trains. No major drama. 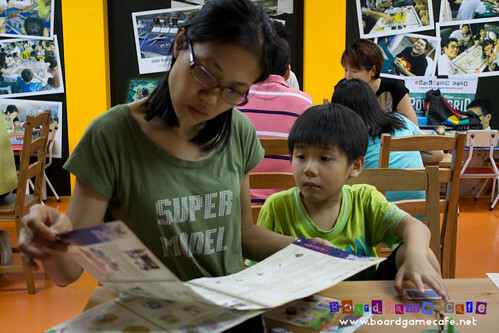 Until the formation of the 5th (TC) and 6th (TC) railway companies by Heng and CK respectively. 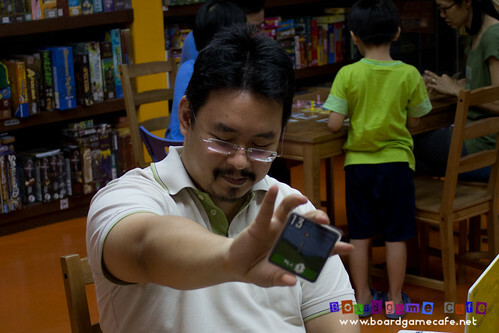 Prior to this, Ivan’s IC has bought the first 5-train (therefore giving him the comfort of a permanent train). So going into the Operation Rounds, we have two new companies and only one 5-train which meant the 6-train would be triggered soon. The 6-train heralds the awesome (or shittish – depending on which side of the fence you are sitting) train rush. 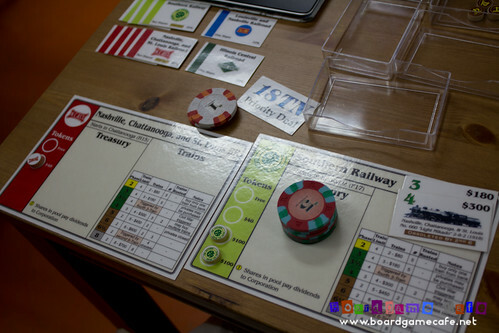 Being an intro game to 18xx, 18TN’s train rush tends to be stressful without being fatal. Which is good as it allows the newbie to experience the blood rush during the train rush stage and yet have them eager to come back for more! My GM&O and TC were nicely set-up for GM&O to buy the first 6-train (the last 5-train would have already been bought by Heng’s new NCSL prior to my GM&O’s operating turn) and TC to buy the second (and last) 6-train. This would have the effect of killing off everyone’s existing 3- and 4-trains (at OTK we always play without the (gentler) “delay obsolecense” rule for 4-trains). Heng’s two railway companies; the newly formed NCSL and his first SR. His new NCSL – having no train – but running earlier in the Op Round (just after Ivan’s IC) would certainly get the last 5-train. His SR would still remain train-locked and won’t be able to get a 6-train (yet) but I remembered his SR has enough cash in the treasury to acquire a permanent train (so not much of a worry here). However the purchase of both 6-trains would result in the early railway companies like Henry’s L&N without any train, triggering the mandatory train purchase clause and with L&N having a very low treasury, Henry (as CEO) had to contribute from his own pocket to pay for a new 7-train $700. 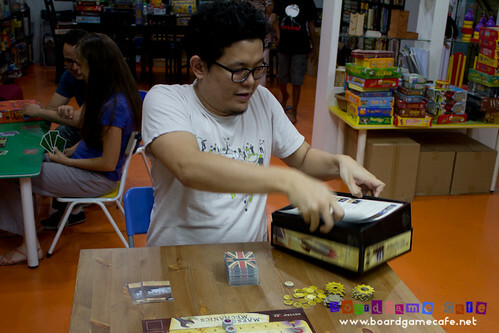 If Henry has insufficient cash, he has to sell his own shares to raise funds. This was where it went belly-up for Henry as he could not raise the necessary funds ($700) to contribute towards his L&N’s mandatory train purchase after all it’s existing 3- and 4-trains were obsoleted by the new 6-trains. 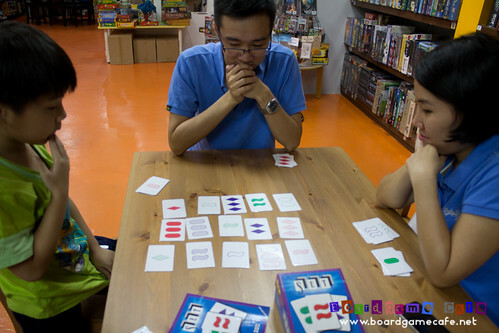 He went bankrupt which ended the game (prematurely). When we do a net worth tally, Ivan won with his $1,000+ to mine & Heng’s $700+. He has largely been an investor until he started his IC. GG! Henry’s L&N has in fact withheld a few rounds of earnings yet still found itself short of the required moolah to buy the 7-train. 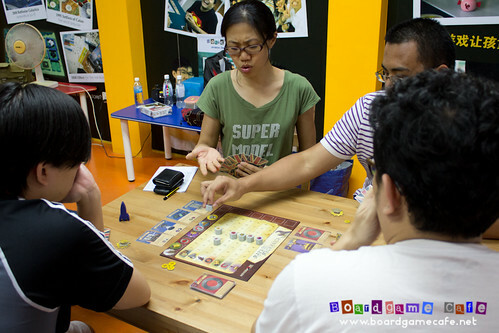 Heng’s theory was that the bypassing of TC hurt it’s revenue earnings in the early game rounds. 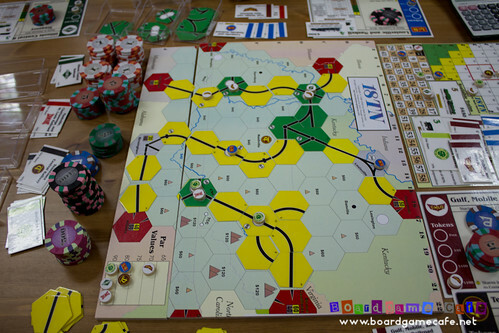 This session lasted less than 1.5 hours and appeared to have given Ivan an almost perfect intro to the 18xx system – investor mode, dumping shares to depress prices, train rush and bankruptcy. 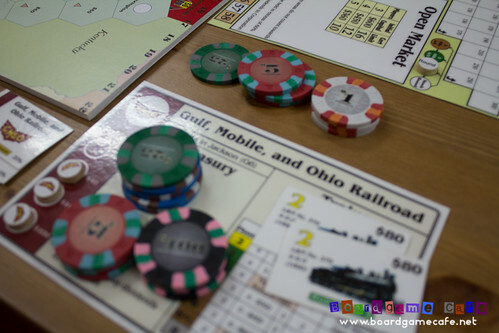 It was good to get an 18xx to the table as it has been a long time since we last did an 18xx game. 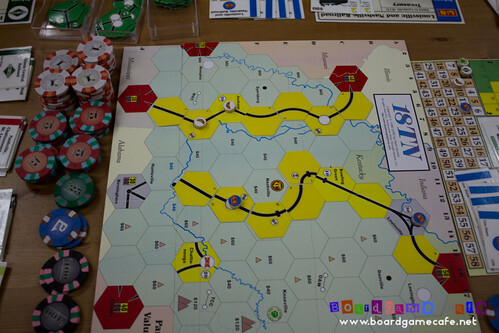 While the small map of 18TN might present an impression that this is a very simple and quick game of 18xx, today’s session uncovered another layer for me. 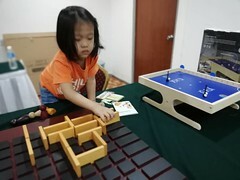 It’s possible to use 18TN as a competition game; it’s basic enough that you do not have to understand additional “small rules” yet present an interesting problem right from the start – reining in the owner of L&N as he makes a quick dash for the finish line. 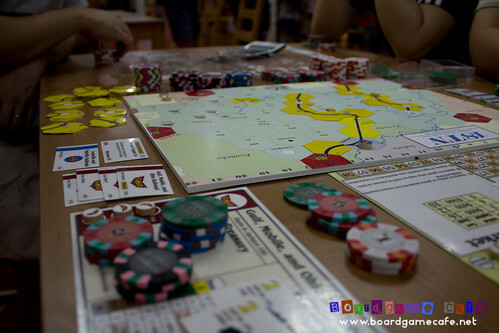 And while you can only buy one train at each op round – which is meant to slow down the train rush – today’s session had a pretty quick & accelerated train rush in the mid-game stage – I think some of the 4-trains were used not more than one stock round before they were burned by the incoming 6-train. 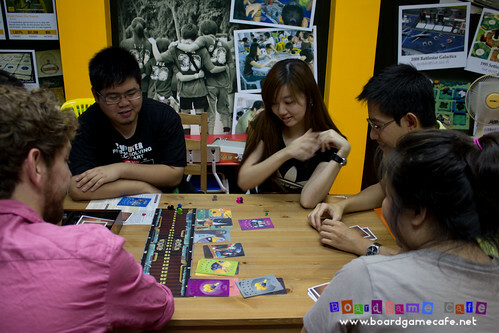 There are only 6 companies in this game so a 5-player competitive game will see a brutal winner-take-all session. 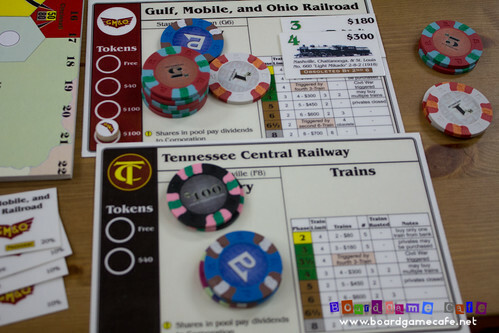 Recommended: If you wish to understand more about the 18xx system, here’s a detail write-up of an 18TN session held at OTK back in 2009 (click here to read). 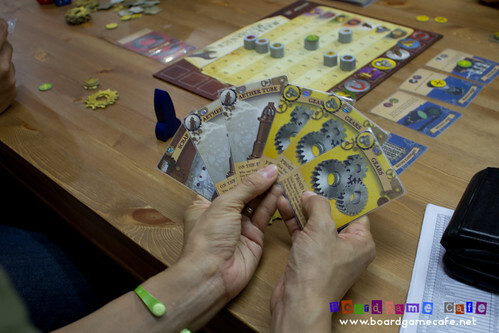 One game we’d prepared to get playtime tonight but didn’t was STARTUP FEVER, the first among the Kickstarter games that we pledged back in 2011. 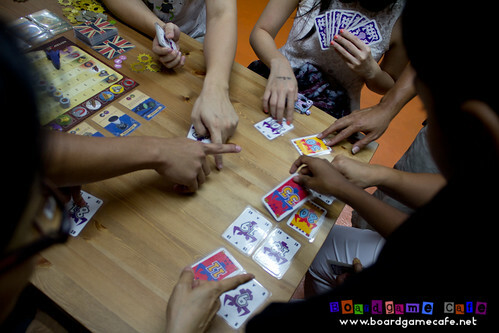 We’d a first-play at MAGACON at the end of 2011 but haven’t had the chance to rotate this game back to the OTK tables since. 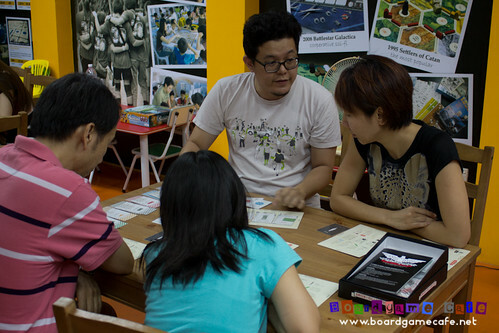 Thanks to everyone who came and made this a great Kickstarter Night! Looking forward to seeing you all in our future meetups. 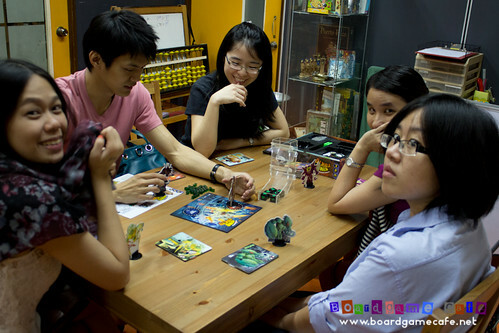 Recommended reading: Monster Kickstarters coming (for an interesting read on Kickstarter boardgames since 2010). 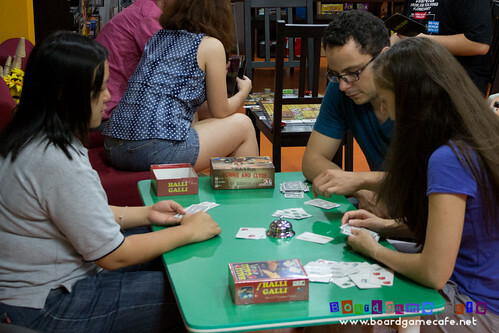 And check out our Facebook photo album for more pictures of tonight’s Kickstarter meetup session.